At the Venice film festival a couple of days ago a young woman did what most of us have been yearning to do for years; pounce on Brad Pitt. As he walked down the red carpet she threw her arms around him and hugged him. Brad was not impressed; she says she has no regrets. The Daily Mail of course called her a “crazed female fan”. Seems saner than most to me. Crazy would be to let him walk past without lunging. Ever since I first saw him in those Levi 501s in Thelma & Louise (possibly the greatest film ever made and not just because Brad is in it) I have been in love with Brad Pitt. When my husband asked me to marry him I promised to be faithful. “Unless Brad Pitt seduces me,” I added. My husband saw this as an unlikely enough event to agree to my proviso. I remember going to see A River Runs Through It at the Fulham cinema years ago with three other girlfriends. We sat in the front row and sighed every time he graced the screen. He was so beautiful it was almost painful to watch him. Now of course he’s gone off a bit. The floppy blond hair has gone mousey and short. And he does seem to have a penchant for facial hair in strange places. 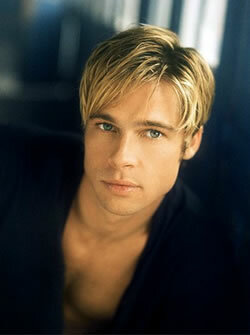 But to a whole generation of women like me he will always be one of the sexiest men ever. “There he goes,” says Thelma as he walks off in his 501s. “I love to watch him go.” Amazing that he was in that film for a total of 14 minutes but none of us ever forgot him. So well done you crazy Italian, next time give him a kiss from me. the picture at the top of the post made me gasp out loud – he was so beautiful. thank you that’s made my day.